Here’s something you probably haven’t heard: getting an individual health insurance policy is far easier today than it was before the government’s disastrous health insurance exchange rollout. I know that’s not what you’ve read elsewhere, but it’s true, and we’re going to prove it to you. More importantly, we’re going to show you easy ways to shop for health insurance that completely bypass the error plagued website. By all accounts, the Federal Government’s health insurance site, Healthcare.gov, is a complete mess. That’s the website were individuals were supposed to be able to shop for and buy health insurance plans under the newly enacted healthcare legislation. The site launched on October 1, and promptly failed. Nearly a month later, few people have actually been able to purchase insurance through the site. The best guess is that it will take at least another month to fix. At this point, though, nobody really knows when it will operate correctly. But even if the site isn’t fixed, you may be surprised to learn that you can still get health insurance quite easily under Obamacare. An important, but seldom mentioned, fact is that the troubled Healthcare.gov site doesn’t serve every single state. And even for the states that it does serve it isn’t the only way to get insurance. If you live in any of the states listed in the nearby chart, you won’t deal with Healthcare.gov at all. Instead, you’ll shop for insurance on a completely different state-designed website. We’ve put together a list of those sites’ urls for your convenience. And even if you live in one of the other states covered by Healthcare.gov, you don’t have to use the federal site to get health insurance. You can still buy insurance directly from an insurance company or through a broker without ever dealing with the government website. The one thing you need to know about this approach is that policies purchased directly from insurers, so-called “Off Exchange Plans,” don’t qualify for federal subsidies. You’ll still benefit from all the other protections of Obamacare but to get subsidized health insurance you will need to purchase that insurance through the federal or state websites. But here’s the thing. When we got our individual policy in 2010 there were no subsidies available at all. So not getting subsidies today because Healthcare.gov is a steaming pile doesn’t make the situation worse than it was before. It makes it the same. Meanwhile, other features of the new law give us protections we’ve never had before, like the ability to buy insurance that covers pre-existing conditions. On balance, that’s an improvement. What’s more, not everyone even qualifies for subsidies. If your income exceeds 400% of the poverty line, you are ineligible for federal subsidies anyway. (calculate your percentage here.) If you’re one of the 100-odd million Americans who earn too much for subsides, you can pretty much ignore all the Healthcare.gov press and just go shopping for an individual health insurance policy. You just have to do it old school. And by old school we mean all the way back to before October 1, 2013. What we did in those good old days is compared health insurance plans at functioning sites like eHealthInsurance.com. Even in the age of Obamacare, that’s still a great source for sizing up various policies. By punching in my zip code and date of birth eHealthInsurance quickly provided summaries and prices for 18 different plans available in my state. Once I identify a policy that suits my needs, I can purchase it directly from the insurer’s website and skip the federal exchange altogether. Humana’s site, for example, tells me that I can buy insurance from them in about 15 minutes. They also give me a helpful list of information I’ll need to have handy to complete my application. 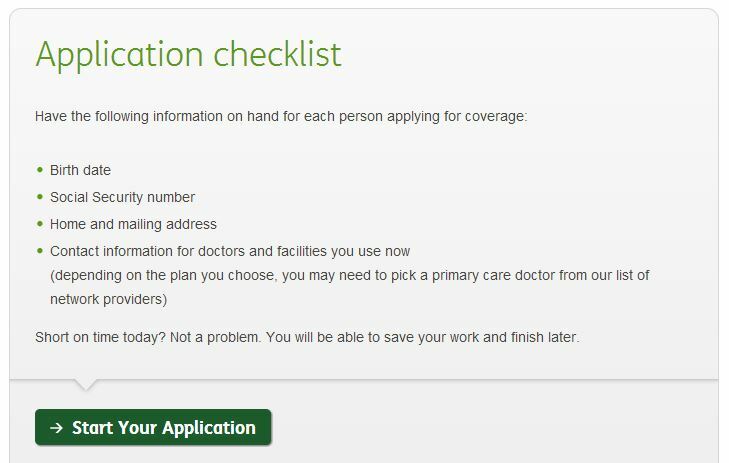 Humana now asks for this limited set of information instead of the 5 years of medical history we were required to provide before Obamacare. Now contrast this post-Obamacare health insurance process, often described as disastrous, to the shopping experience we dealt with previously. Prior to Obamacare we still went to eHealthInsurance.com to compare offerings from various insurers. But once we found a plan we liked we couldn’t just purchase it. We had to convince the insurance company to insure us. In our case that involved answering 49 specific questions about the previous five years of our health and healthcare. Some of those questions were easy to answer. “Had either of us had chest pain or a heart attack.” No. Huh? Are we sure we even know the answer? What if our doctor failed to tell us of an “abnormal” or inconclusive result because he didn’t think it worth mentioning? Could our insurance company really cancel our coverage because of that omission? Yes, they could. The following clause printed in bold across the top of our application assured us of that fact (emphasis added). Another way to say the same thing is that our insurance is valid up until the point we need it. Once we submit a large claim, the insurance company reserves the right to review our file and see if they can find a way to avoid paying the claim. To guard against that possibility we spent countless hours on the phone calling old physicians to try to get them to fax us our medical records. No easy task. Doctors have better things to do than deal with ex-patient medical records from a half decade ago. In all, it took us over a month to pull together the information we needed. By the time we were ready to submit our application it had grown to 34 pages. And even with all that information we had no guarantee we’d even be allowed to buy insurance. All we could do was submit our application and hope to be accepted. If ever we wanted to change insurers or even move to a different state we’d need to go through that entire process again. But no longer. Now, because of the new law, insurers can’t reject us because of pre-existing conditions. That means the lengthy application process we endured, along with all its uncertainties and hidden traps, is a thing of the past. Instead of needing to recall every doctor visit, treatment, procedure or prescription to apply for insurance, now all we need is our birth date and social security number. We’re told that the official rollout of Obamacare is a disaster, and in a way that is true. Compared to a modern e-commerce site Healthcare.gov is an inexcusable wreck. But the right comparison isn’t between Healthcare.gov and Amazon.com. It’s between the individual health insurance market we had before and the one we have now. And that old system really was an unmitigated catastrophe. It required you to jump through hoops to even have a chance of purchasing insurance specifically designed to not pay the very expenses you want to insure. That last point made individual health insurance policies, if you were fortunate enough to even get one, potentially worthless. Now the hoops are gone and the insurance is reliable, we just have to work around a broken website. All in all, that is a huge improvement. Thank you for this. You have truly done a public service, printing news we can use. As an uninsurable person (2 heart procedures, 3 feet, and an ear) no one would want me. It’s good to know the ACA will take me in should my employer’s plan be terminated. The point you make about skipping the government site has really not come up on other sites. Yeah. I think the press coverage has been pretty mediocre. Anyone currently trapped in a terrible job because they can’t get health insurance any other way must be pretty discouraged. We wanted to write an article letting those folks know that there are still options. Excellent and informative post Brian. Really helped. Thanks-a-lot. This is very helpful. It required a bit of research on your part to pull all of this info together in one place. I hope you don’t mind if I put a link in my own blog post about the ACA (www.brissioni.com) (thebrissioniblog.blogspot.com. I’ve heard that you can bypass the website by calling 1-800-318-2596 and that that works well. Don’t know myself as I’m now on Medicare – talk about irony, the Medigap plans people use to “top-up” Medicare ARE still subject to medical underwriting! You can join any one during a few months either side of the date you become eligible for Medicare, but after that you’re stuck with the one you picked unless you want to go through the mess you outlined. I know that the administration is saying that you can buy health insurance from the government over the phone but I don’t think that is entirely true. You can fill out an application that way, but the folks at the other end of the phone still need to use the non-functioning part of the system to calculate your subsidies. So I think calling gets you part of the way through the process, but not whole way. It is a mess. I sure hope they fix it. Thanks for a rational, reasoned discussion of some important features of the ACA (Obamacare) healthcare program. There is a great deal to be gained from starting to implement meaningful change to a badly flawed U.S. healthcare system. It’s complex and difficult to do, but we have to start somewhere. It’s a certainty that it will need to be modified and improved over time based on assessment of outcomes and benefit of experience. But the irrational histrionics so often heard from certain media sources and organizations are misleading and unhelpful. Let’s hope the poor performance of the Healthcare.gov website is repaired and we can move on with sensible and improved healthcare change. I can’t help but wonder why there wasn’t this fuss over the equally messed up launch of the Bush-drug plan (Part D Medicare)? From what I hear, the same was true for MediCare and Social Security. You’d almost think some folk don’t want us to have these social safety nets. One just has to shake one’s head about the Healthcare.gov website. Such an important new program, so many competent programmers out there they could have hired, and yet they screw it up. You rightfully point out that Healthcare.gov wouldn’t even have been needed had those recalcitrant Republican states created their own health insurance exchanges like they were supposed to. The shutdown/default fiasco created by the Republicans managed to divert a lot of attention away from the launch of Obamacare. Maybe they did us a favor.